Gloria Johnson’s life changed in the blink of an eye. 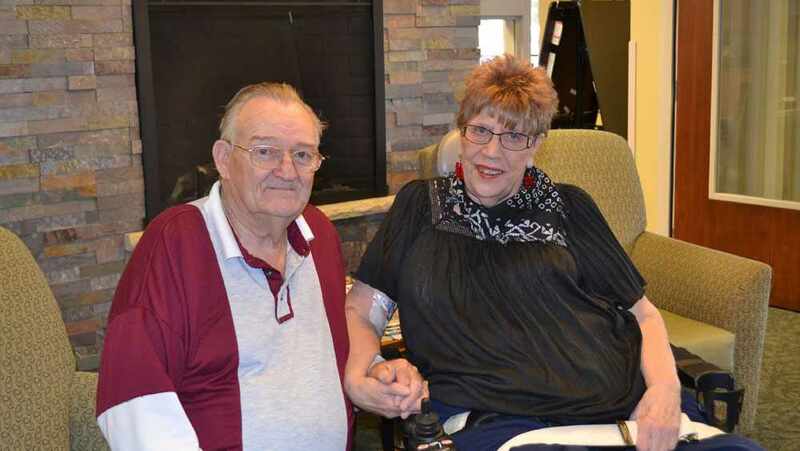 Gloria and her husband, Floyd, were camping in South Dakota in August 2013, when her body’s temperature skyrocketed to 104.6 degrees, and her body went limp. She went from enjoying her time at a campground to being paralyzed from the neck down. She was diagnosed with West Nile virus, which is transmitted by mosquitoes. Most people infected with West Nile virus experience a slight fever or a mild headache. Gloria was in the minority – less than one percent – of people affected neurologically by the virus. She ended up being admitted to an intensive care unit at Mayo Clinic's Rochester campus. Because of her paralysis, Gloria needed a ventilator to breathe. As she began to recover and no longer needed the tertiary level of care provided by Mayo Clinic's intensive care unit, Gloria's care team recommended she continue to receive care at Mayo Clinic Health System’s care center in nearby Lake City, Minnesota. Lake City has the specialized equipment and staff with advanced training to care for the extensive needs of ventilator patients as part of the Mayo Post-Acute Care Program. During her six-month stay at the Lake Center care center in 2014, Gloria spent countless hours with physical, occupational, speech and respiratory therapists. Eventually, she regained enough strength and breathing function to be able to be liberated from the ventilator. While not every patient can be liberated from a ventilator, Lake City’s vent program has been successful with patients who meet the appropriate criteria. Join a conversation about your health on Mayo Clinic Connect.